If you’ve been holding out on buying a fitness tracker then now might be the time, as the Fitbit Charge 3 has been announced and it’s packed full of features that take it way beyond being just a glorified pedometer. From a swim-proof build to sleep tracking and more there’s a whole lot here, but just how much of it is new? And is it worth choosing over the Fitbit Charge 2? That second question will be somewhat subjective, but to help you decide for yourself we’ve put the two trackers head to head, comparing their core features. Before you read on for that though, be sure to check out our hands on video review below. Both the Fitbit Charge 2 and Fitbit Charge 3 have a rectangular screen and a band that’s as wide as the body, but the design has been refined and tweaked for the Fitbit Charge 3. For one thing the Fitbit Charge 3 is thinner, so it looks less chunky on your wrist. It’s much lighter too, and it’s made from aluminum, while the Fitbit Charge 2’s body is clad in stainless steel, which could be why the new band is so much lighter. The screen is a much bigger difference though, as the display on the Fitbit Charge 3 is 40% larger than the one on the Charge 2. It’s still black and white, but it has also had a resolution boost. The biggest change to the screen though is that this time it’s a proper touchscreen, whereas on the Fitbit Charge 2 you can tap it to switch what it’s displaying but that’s about it. The Fitbit Charge 3 has an inductive button for going back a screen or waking the tracker up, but you can depend much more on the touchscreen interface this time around. The Fitbit Charge 2 has a heart rate monitor, step and calorie tracking, sleep tracking and multi-sport tracking, so you can actually track your workouts. It can also automatically detect exercise, so you won’t need to manually enable most modes. The Fitbit Charge 3 has all that but also adds to and improves on it. For example, it’s waterproof to 50 meters, so you can take it swimming, while the Fitbit Charge 2 is just splash-proof. Sleep tracking has also been improved for the Fitbit Charge 3, and further updates later this year will add a Sleep Score to the mix. You can also now do more direct from the device itself, as for example you can set goals without heading to the app. The Fitbit Charge 3 will also offer a Female Health feature, with things like ovulation tracking. So the Charge 3 sounds like a much more comprehensive health and fitness device overall, though it’s worth noting that neither of these trackers include GPS. Instead they use Connected GPS, which relies on your phone. Beyond the fitness features, both the Charge 2 and Charge 3 can also display notifications from your phone, but they’re set to be more useful on the Fitbit Charge 3, as the ability to accept and decline calls from the tracker is being added down the line as a software update, as is Quick Replies, which if you have an Android phone allows you to reply to messages or calls with a pre-made message. On the Fitbit Charge 2 you can’t interact with notifications at all, so if you want to do more than read them you’ll have to get your phone out. Some versions of the Fitbit Charge 3 also include Fitbit Pay, meaning you can make contactless payments using your tracker. This isn't possible on the Fitbit Charge 2. Fitbit claims that the Fitbit Charge 2 offers up to five days of battery life, and while we didn’t get quite that much when reviewing it, we were making extensive use of all its features. The Fitbit Charge 3 should last longer though, as Fitbit claims this can keep going for up to 7 days. Heavy use will probably decrease the longevity, as with the Charge 2, but we’d expect you’ll still get more life out of it than its predecessor overall. The Fitbit Charge 3 is available to pre-order now and will hit stores in early October. If you want it you can get the standard version for $149.95 / £129.99 / AU$229.95. This comes in graphite aluminum with a black band or in rose gold with a blue/grey band. Alternatively, there’s a special edition model which adds Fitbit Pay support and comes with a white perforated silicone band or a purple woven band. 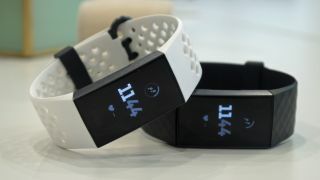 It also comes with a spare band and costs $169.95 / £149.99 / AU$269.95. The Fitbit Charge 2 is of course out now and launched at $150 / £129.99 / AU$250, though shop around and you should be able to find it for less. There’s also a special edition for $179.95 / £149.99 / AU$289.95 (which changes the design but doesn't add Fitbit Pay), though that too is now normally cheaper. In other words then at full price the Fitbit Charge 2 is very similar to the Fitbit Charge 3, but it’s often cheaper in reality and will probably get cheaper still now the Charge 3 is out. While the Fitbit Charge 3 might look similar to the Fitbit Charge 2 at first glance, look closer and it’s a very different device. It has all the same core features but with lots of newer and better ones too, notably the likes of swim-proofing and longer battery life have been added. It still lacks onboard GPS, so look elsewhere if that’s something you need, but otherwise the Fitbit Charge 3 could make a good choice for your next fitness tracker – though you might want to wait for our full review just to be sure. The Fitbit Charge 2 remains a decent device as well though, so if you don’t need the new features and can find that for substantially cheaper it too could be a good choice.